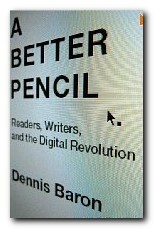 A Better Pencil is a study that traces the relationships between writing and reading and the technology used as the medium of communication – from the invention of writing, the development of the printing press, then the typewriter, to the modern computer. It’s a book about how the digital revolution is impacting our reading and writing practices, and how the latest technologies of the word differ from what came before. In this sense Dennis Baron has produced a similar work to that of his namesake Naomi Baron’s Alphabet to Email though his emphasis is less on historical development and more on exploring topics related to the issue. In fact I was rather glad he didn’t take a strictly chronological approach, which would have delayed annoyingly any revelations he might have about electronic writing. But the problem with his thematic structure is that many of his observations are made over and over again, each one of which he seems to imagine to be the first. The one basic argument which he repeats is that each development in the technology of literacy was at first introduction regarded with suspicion. Even writing itself, which it was thought (by Plato) would lead to the decline of human memory. Then printing, which some people opposed on the grounds that it would lead to the dissemination of new ideas and the loss of respect for the authority of the church – and they were right. What he’s doing in fact is looking at commonly held notions about computer technology and trying to dissipate widespread fears and misconceptions. Will computers lead to a decline in literacy. Answer – No. Will they rot our children’s brains – no. And so on. The idea that some people are suspicious of technology is examined at some length by a study of the Unabomber – the technophobe terrorist who was ironically caught out only when he published his manifesto. The story is well told, and it’s entertaining enough – but it tells us almost nothing about writing or technology that we didn’t already know. However, this is a book that becomes more interesting as it goes on. There’s quite a good chapter on the history of the pencil (much of it taken from the work of Henry Petrowski) that throws up quite a few interesting observations. He argues for instance that writing in pencil lacks status because the pencil post-dates the pen in historical development. Its traces can be wiped out of course, yet some pencils do not have erasers – for very good reasons. Joiners don’t want to leave graphite smears on their work, and golfers should not alter their scores. It doesn’t take us much closer to electronic writing, but there’s a very amusing chapter on handwriting in which he exposes the bogus claims of graphologists (sloping left script = suicidal tendencies: that sort of rubbish). He makes the more serious point that people repeatedly claim current handwriting practice is a falling off in standards from some previous golden era in which everybody wrote in beautiful copperplate script. This too just isn’t true. Once he gets to word-processors all his lines of argument begin to come together. Anyone who has followed the development of writing with a PC will be fondly reminded of the early frustrations as he describes his experiences using VAX, WordStar, and WordPerfect. As he rightly claims, all new developments in writing technology seem to slow down the writing process when they are first introduced. He looks at the conventions, plus the advantages and disadvantages of all forms of on-screen writing – email, web pages, Instant Messaging, and blogs. Each of these has so rapidly replaced its predecessors that the conventions often change with the matter of a few years. Something hip with the kids one moment becomes old hat the next – particularly when adults get involved. That’s happening on Facebook and Twitter right now. Most of these are new opportunities for self-expression rather than new writing technologies – though he might have included text messaging as an almost coded form of communication. Wikis are also new in that they are anonymous user-generated writing in which individual contributors sacrifice notions of personal authorship for the sake of a common good. He ends with a look at what he calls the ‘dark side of the web’ – the world of hate groups, email scams, and political censorship. I was glad he didn’t let the illustrious Google off the hook for the way in which they (and MSN) have capitulated to China, the world’s leader in state-sponsored cyber snooping (with an estimated 30,000 people employed in spying on their fellow citizens). And they’re not alone: Cuba, North Korea, Saudi Arabia, and Burma (Myanmar) are doing the same thing. 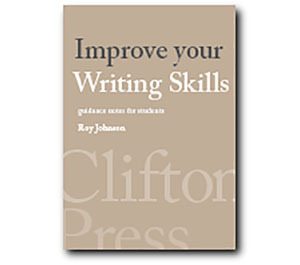 One of Baron’s other central arguments is that revolutions in our writing behaviour take place when the technology becomes cheap and ubiquitous enough to put new tools in everybody’s hands. Things are moving so fast in digital technology just at the moment that it’s hard to keep up or predict what might happen next. But this survey is an excellent account of the status quo at 2008/2009.